If you've always considered yourself a little bit of a "science geek," you may want to consider becoming a biochemist or biophysicist. Not only are these types of positions key to developing further knowledge about living organisms, they're also growing like crazy. The Bureau of Labor Statistics expects these fields to grow by 37.42 percent between 2008 and 2018, making now the perfect time to enter the field. Biological scientists do really interesting work investigating living organisms and studying how chemical compositions and physical properties effect living cells. Biochemists specifically look at the chemical composition of living cells and how chemical reactions take place during metabolism, reproduction and growth. Biophysicists look at the principles of physics and study how these principles affect living organisms. Most biological scientists are involved in research that helps expand the available knowledge base in the hopes that new knowledge will enable the development of products or processes that will enhance life. Most biological scientists have to focus on either basic or applied research. Basic research is focused on expanding knowledge without necessarily being able to immediately apply that knowledge to solve a specific problem. Applied research is research with a broader scope - it's generally harder to control but it has a more immediate application to answering specific problems. The best way to differentiate between basic and applied research is that basic research is generally performed in a lab and doesn't involve living specimens of the organism being researched (i.e., living humans, monkeys, rats, etc.). Applied research may be performed in more "real life" situations that involve the living organism being studied. There are pros and cons to both types of research and biochemists and biophysicists need to determine which type of research they're more interested in before pursuing one or the other. That said, because the fields of biochemistry and biophysics are so specific, there are usually more basic research positions available than applied research positions. Biochemists and biophysicists are biologists with additional education and training in chemistry or physics, respectively. At a bare minimum, each field needs a Ph.D. in biology along with additional education in the specialty field in order to qualify for academic or independent research positions. Many research positions also require postdoctoral research experience. There may be some positions in applied research that will hire individuals with a bachelor's or master's degree, but these are limited and the scope of practice will also be limited. To be able to advance within the field, you really must have a terminal degree. 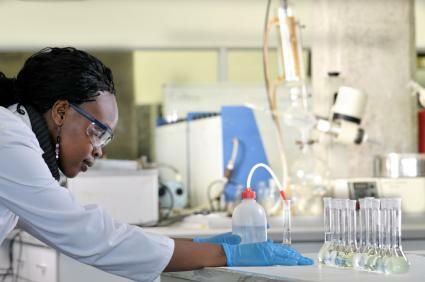 Most biochemists and biophysicists will work at universities, pharmaceutical companies, research organizations or within the national government as part of a research agency. While extensive knowledge in research and science is required, individuals must also be able to communicate effectively, write and present well. This is because these scientists must be able to write up and present their study findings to stakeholders and the larger academic society. Biochemists and biophysicists who take positions at colleges and universities may also be asked to teach undergraduate and graduate courses within their field of expertise. In some cases, scientists who take on these professorships will be asked to mentor doctoral students and work with a team of burgeoning scientists to further expand the research performed at the university. The day-to-day life of a biochemist or biophysicist will vary depending on the organization in which they work, but a large portion of their time will be spent in the lab, performing research, working with high tech equipment and running statistical analysis on study findings. While most biochemists and biophysicists can expect a 40 hour work week, professors may have to spend additional time grading papers, writing research studies and applying for grants to help fund the research. A final word to the wise: biochemist and biophysicist careers can be extremely rewarding, but the road to becoming a full-fledged scientist can be long and hard, and the academic life isn't always an easy one. Make sure you're entirely committed to the field before spending years of time, money and effort pursing your education and experience.